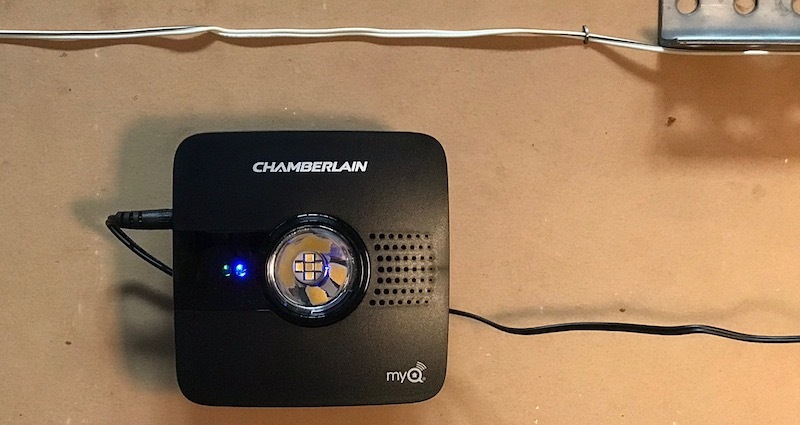 Back in January at CES, Chamberlain announced plans to release MyQ Home Bridge, a hardware hub to allow connected garage openers in the company's MyQ ecosystem to work with HomeKit. The MyQ Home Bridge was initially scheduled to launch in April, but as is common with these types of products needing to gain HomeKit certification, it was pushed back a bit and had a brief quiet launch earlier this month with an official launch coming just yesterday. The MyQ Home Bridge requires that your existing garage door opener already support MyQ wireless connectivity through one of three methods: built-in MyQ Wi-Fi support within the opener, a non-smart garage door opener linked to a MyQ Garage hub, or add-on Wi-Fi connectivity for a MyQ-enabled opener using a MyQ Internet Gateway. 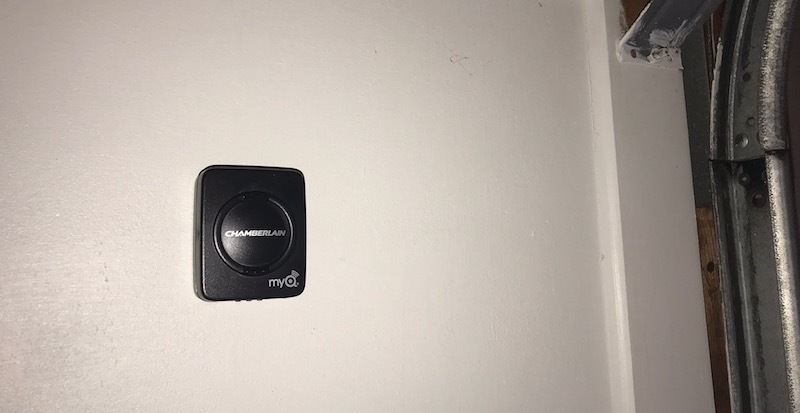 I own a Chamberlain chain drive garage door opener from 2009, but it does not include any MyQ technology built in, so in order to add HomeKit support to my setup I needed to install two separate pieces of hardware: a MyQ Garage for basic Wi-Fi support and then the new MyQ Home Bridge to add HomeKit compatibility. Alongside the original MyQ Home Bridge announcement in January, Chamberlain also disclosed plans for a Smart Garage Hub that will consolidate both the MyQ Garage and MyQ Home Bridge functions into a single piece of hardware. The Smart Garage Hub was originally planned to debut in July, but Chamberlain tells me its launch has been delayed and the company is not yet sharing any new target dates for it. Working with my current dumb garage door opener, the first step was to install the MyQ Garage to get my opener online. It was a simple, straightforward process that only took about 15 minutes. The system uses a couple of screws to attach a metal bracket to the ceiling in the general vicinity of the garage door opener, at least two feet away from the opener itself but still visible when standing in the garage door opening. The MyQ Garage slides onto the metal bracket and a power adapter plugs into an outlet, with excess cord able to be wrapped around the metal bracket. A separate door sensor is affixed to the top panel of the garage door itself, with either velcro strips or screws. The simple sensor wirelessly informs the MyQ Garage hub whether the door is up or down, based on the sensor's orientation. It runs on a replaceable CR2450 button battery. The rest of the setup happens within the Chamberlain MyQ app, which requires you to create a MyQ account and instructs you to connect to the MyQ Garage via Bluetooth to enable sharing of your device's Wi-Fi settings during setup. Once the MyQ Garage is online, the app walks you through the steps of pairing the MyQ garage with your opener through the opener's program button, tests the door sensor's communication with the main hub, and lets you name your opener in the MyQ system. The app isn't particularly pretty and it hasn't even been fully optimized for recent larger-screened iPhones, but it gets the job done. It does support Touch ID, so it's easy to authenticate your MyQ account credentials whenever you open the app. The app lets you easily see your garage door opener(s) and their current status, as well as how long they've been open or closed for. Tapping on the door in the app will raise or lower it. On the safety side, it's important to note that garage doors are inherently dangerous, as children who are not paying attention have occasionally been injured or killed by closing doors. As a result, modern garage door openers are equipped with sensors that detect if there is anything underneath the garage door at ground level as the door is descending, automatically reversing the door if an obstruction is detected. Garage door opener instruction manuals also encourage users to visually supervise the door as it opens or closes to ensure safe operation. Because connected garage door openers can be operated remotely via app and thus without visual confirmation of safe operation, the MyQ Garage includes warning signals just prior to the door closing. Tapping the garage door in the app to lower it results in several seconds of fairly loud, high-pitched beeping, accompanied by flashing, bright white light from the MyQ Garage hub prior to the door starting to come down. The audio and visual warnings alert anyone in the vicinity that the door will be descending, and the beeping continues for the entire time the door is closing. It's an important safety feature, but it also means you may want to avoid using the app to close the door at certain times if the opener is, for example, located directly below a bedroom where someone may be sleeping. 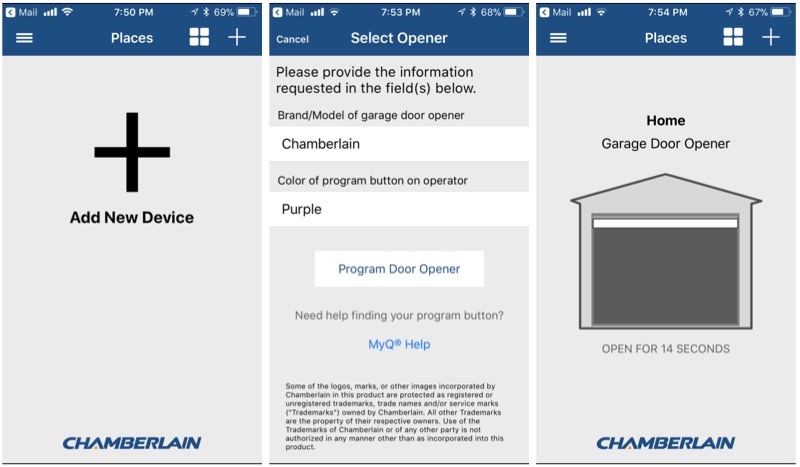 The Chamberlain MyQ app allows you to set up alerts and schedules for your garage door, making sure you're kept up to date on the status of your door and letting you automatically ensure the door is closed every night, for example. 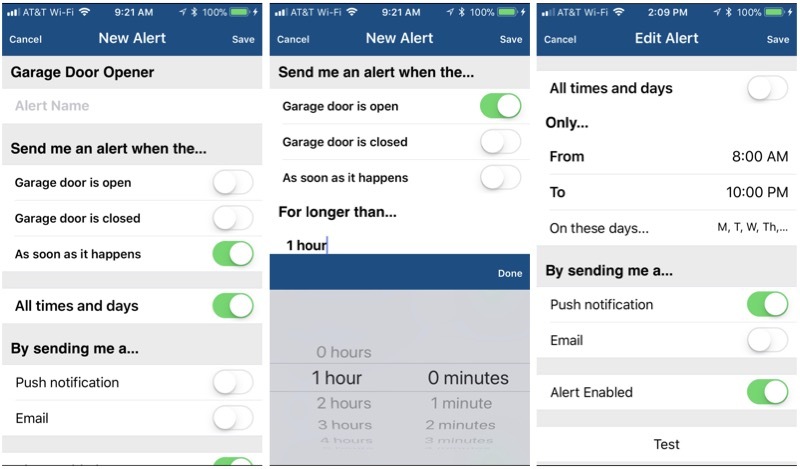 With alerts, you can choose to receive them via push notifications, email, or both, and you can be alerted whenever your garage door is open or closed. Options allow you to specify only certain days and times during which you want to be alerted, as well as whether you want to be notified as soon as the event happens or after a certain time threshold is reached. For example, you can set up an alert to be notified only if the garage door has been open for more than an hour. With multiple alerts, you can account for your daily schedule, such as setting up immediate alerts during the workday when no one is expected to be home, but only notifying after an hour or so at other days and times when people are more likely to be around the house. Schedules, as the name suggests, allow you to set up a fixed time of day (every day or only specific days of the week) to close the door, for example. For garage doors, only closing the door is supported, so you can't set the garage door to open on a specific schedule within the MyQ app. If you have other devices such as remote lights integrated with your MyQ system, you can also schedule them to turn on or off. Even without HomeKit, schedules are a great way to automatically make sure your garage door is closed in the evenings before heading to bed, and you can receive confirmation via email or push notification. Chamberlain's MyQ system also supports integration with Nest (including the ability to adjust Nest thermostats and view Nest Cam video), as well as smart home integrations through XFINITY Home, Wink, and IFTTT. 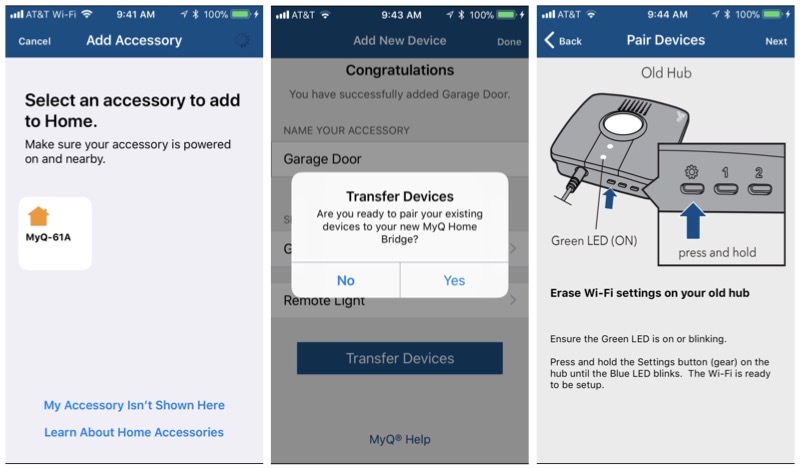 If you're lucky, you already have a garage door opener with MyQ support built-in and you can start the process of getting it integrated with HomeKit here. Similarly, if you already had a MyQ Internet Gateway, you'll be able to replace that with the MyQ Home Bridge. And if you're like me, you just went through the process of installing a MyQ Garage and now you're ready to install your second hardware box. 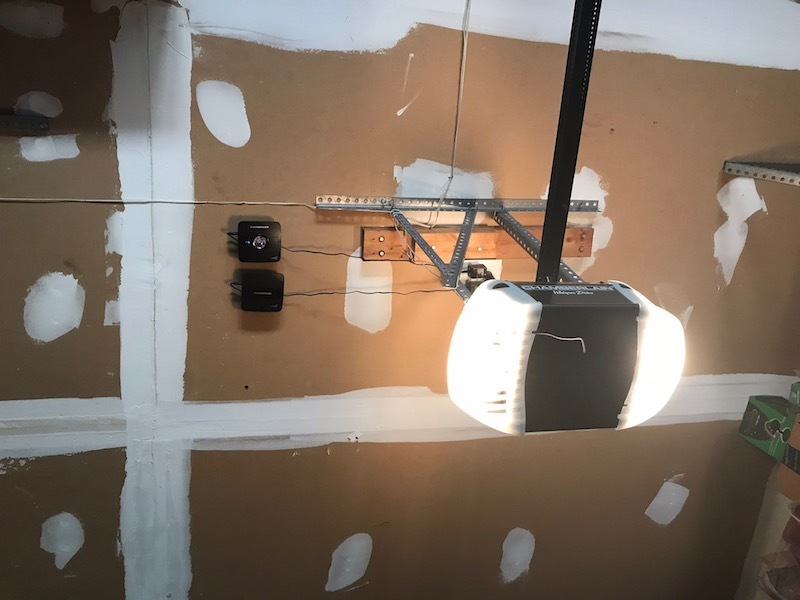 Installation of the MyQ Home Bridge is very similar to the MyQ Garage, using the same style of mounting bracket and then sliding the bridge onto the bracket, plugging it in, and wrapping excess cord around the bracket. The Chamberlain MyQ app then walks you through setting up the bridge with the MyQ and HomeKit systems. It just takes a few steps, after which you'll need to reset your MyQ Garage or MyQ-enabled opener to transfer over to connecting through the bridge. 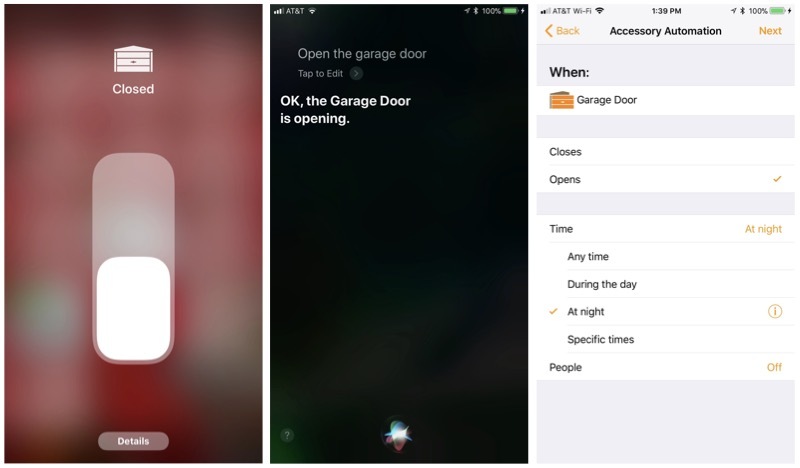 Once that's done, you're all set and you can control your garage door through Apple's Home app or using Siri, or you can continue to use the Chamberlain MyQ app to control the door. HomeKit support also means you can include your garage door within scenes in the Home app, such as for making sure your home is secured, lights turned out, and thermostat adjusted at bedtime. 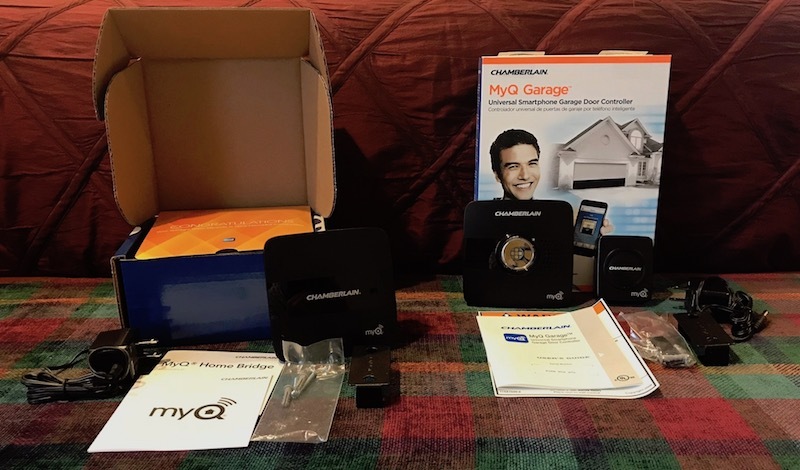 The MyQ Home Bridge is available from Chamberlain's website for an introductory price of $49.99, with the price rising to $69.99 at some point in the future. If you need to add on a MyQ Garage, that's an additional $129.99 from Chamberlain, although some retailers such as Amazon at $99 may have it for less. Regardless, the total is a good chunk of change to lay out if your garage door doesn't already support MyQ, enough to give me pause about whether it's worth the expense. The MyQ app could also use some updating. It generally works just fine, but its lack of large-screen optimization leading to an oversized status bar, keyboard, and date/time pickers is glaring, and there's really no excuse for not having fully updated the app for the larger screens seen on the vast majority of iPhones bought in the past three years. I must admit, however, that the garage door is a nice addition to my HomeKit setup, and if my opener was already MyQ-enabled and I only had to spend the $50 for the MyQ Home Bridge, it would be a no-brainer for me. 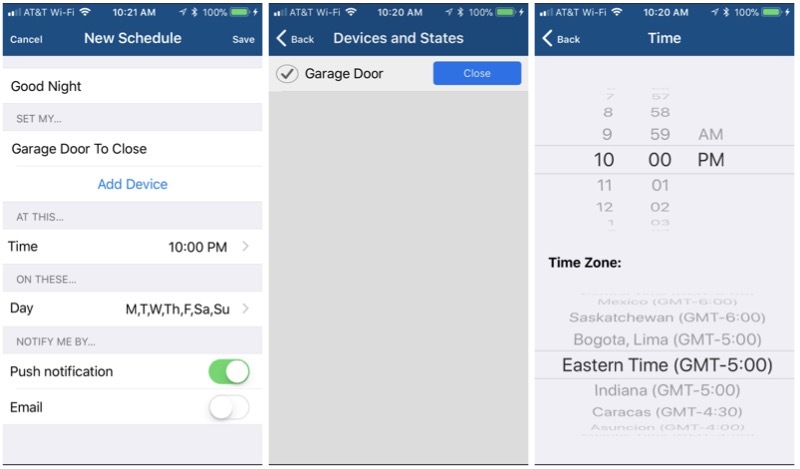 With HomeKit integration and other compatible devices around the house, you can easily set up scenes and triggers involving your garage door opener to maximize your security and convenience. It's extremely handy to be able to do things like make sure the garage door is closed as part of a "Good Night" scene that also turns off lights and adjusts the thermostat, or turn on other lights in the house when you open the garage door at night. If you're going all-in on HomeKit integration and already have a MyQ-enabled garage door, the new MyQ Home Bridge is a worthy purchase. But if you have an older opener that would require installing both a MyQ Garage and a MyQ Home Bridge, I'd probably hold off a bit longer until the announced Smart Home Bridge integrating both functions into a single box becomes available. That should simplify installation and setup and hopefully come in at a cheaper total price than having to purchase two separate hardware boxes. Note: Chamberlain provided the MyQ Home Bridge and MyQ Garage to MacRumors free of charge for the purposes of this review. No other compensation was received. MacRumors is an affiliate partner with Amazon and may earn commissions on purchases made through links in this article. Screw Chamberlain. They announced HomeKit support a couple years ago and a "free upgrade" to current customers that bought the MyQ back then. When it was finally announced this year, Chamberlain said all customers have to buy new MyQ hardware and NO free upgrade. I won't spend another dime with them. This seems like a lot of work to get something as "simple" as HomeKit to work. Not really... I think the previous poster was exaggerating. It beeps for 7-10 seconds, then closes. A handy feature if there's ever a kid or handyman under the door! Sadly I was not exaggerating in the least. Incredibly obnoxious. It is important to note that the behavior and the volume has nothing per se to do with the homebridge product being reviewed here. The speaker is in the GDO itself so it's going to vary by model and even by revision of certain models as chamberlain has changed the speaker over the years. The myq GDO I bought and installed last week is the Lw9000wf (ironically listed as featuring ultra-quiet operation, lol). And the belt noise is indeed incredibly quiet! However the speaker alarm is incredibly loud and piercing and easily audible in my neighbor's house (I checked). It does not stop after a few beeps of warning but rather continues the entire time the unit is closing - absurd. Again, other openers are likely to vary in volume and potentially duration. You don't have to take my word for it - there are plenty of threads on this you can find searching google where people have clipped wires, shot hot glue into the units, etc in order to quiet or silence them. Luckily for me my unit just needed the loose plastic cap pried off and the little free floating speaker disc came out with it. Now it makes what sounds like a loud turn-signalesque clicking sound together with the light flashing 8 or so times - perfect warning before the door starts to close any time of day. Installed mine a couple days ago after purchasing a new myqenabled GDO. The high pitched squeal these units emit is beyond ridiculous both in volume and duration(it continues the entire time the door is closing, not simply an initial alert). My neighbors would kill me if I let that continue so I opened it up and pried off the little plastic cover housing the electropiezo speaker disc. Now it make sure more of a turn-signalesque clicking sound while he light flashes 8 or so times. Perfect earning and no death by neighbors. HomeKit integration and Siri seem to work quite well. Annoying to have waited 2 years since original announcement - delay after delay after delay - and pretty surprised no one else stepped in during that time - but it's here and it works and $50 ain't bad - although they rip you off on shipping. They were charging $37 to ship it here to Hawaii! "Luckily" they screwed up order fulfillment and many of us that ordered on launch day got delayed shipments by 7-10 days so they comped shipping for us. Not that I could see, and it was $12 for SIX DAY SHIPPING. Seriously considered chatting their support to get that waived. I'll have to double check, but I think my wall units are wired. Ahhh ok, makes good sense. So via Control Center I can open one door or the other manually? Via Siri, can it just open the one door (named "Pod Bay") and not the other door (e.g., named "Wife's Door"; teehee, giggle giggle)? If both doors open via Siri command, that would be a little annoying. However, I'm also more interested in a full rip-and-replace to get the newer pseudo-quiet openers instead, since these old ones are loud and chain-driven.